Daniel Defense Aimpoint Micro Mount DD-15003 is designed to be a no-frills, no-nonsense way to securely mount your Aimpoint Micro to the weapon of your choice. Mounts to any military-standard 1913 Picatinny rail using two slotted machine screws that slot into a self-locking thread. The tough construction of these accessory mounts resists vibration and loosening caused by heavy recoil, ensuring your weapon will stay sighted for longer. 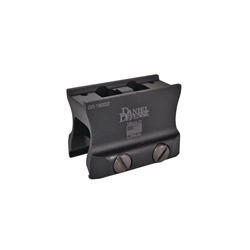 These Daniel Defense mounts attach your Aimpoint red dot sight using the heavy-duty Rock & Lock clamp; what's more, they're low profile, virtually snag-proof, and utterly reversible.